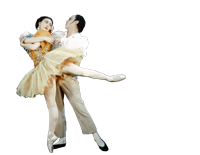 The pas de deux for Masha and Lt Colonel Vershinin was performed several months before the premiere of the full work. Entitled 'Farewell - a pas de deux from Winter Dreams', the excerpt was first performed on 19 July 1990 at a Gala at the London Palladium celebrating Her Majesty Queen Elizabeth The Queen Mother's 90th birthday. When it was performed at the Royal Opera House on 1 August 1990, a programme note explained it was part of a work in progress.